Built to celebrate the federation of Australia in 1901. Above and below, The Municipal Arch, Princes Bridge. King Edward VII Arch, Swanston Street. Above and below, the Chinese Arch, Swanston Street. The German Arch, Collins Street. The Citizens' Arch, Bourke Street. 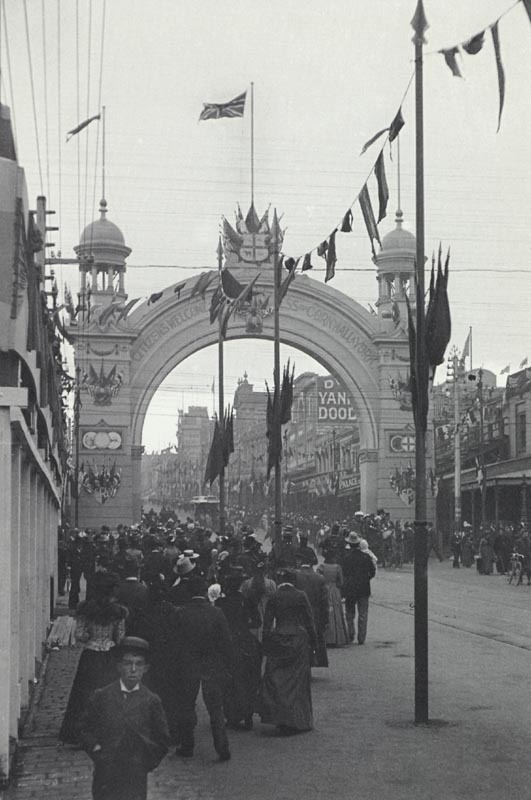 The Duke’s Arch, Bourke Street. Queen Victoria’s Arch, Collins and Russell Street intersection. All these arches were temporary structures. WOW they looked awesome! Probably not very practical re: heavy trucks etc. I wonder whatever happened to them? ^^ They were temporary structures, not made to last. They were probably all demolished the following year. 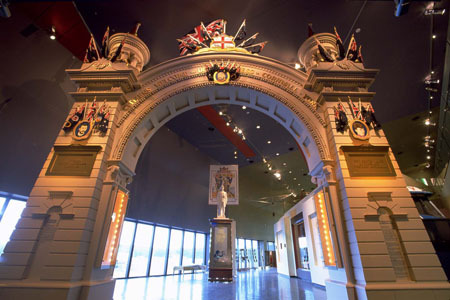 A replica of the Citizens' Arch is in the National Museum of Australia. Photo: National Museum of Australia. 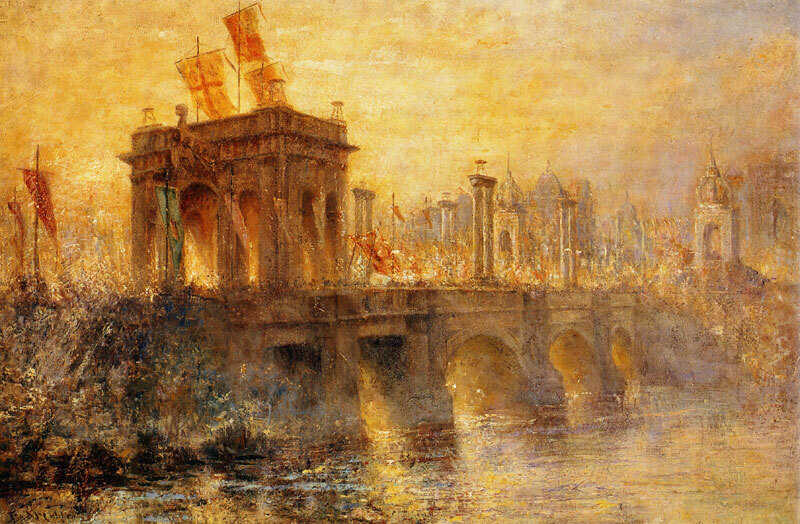 Frederick McCubbin Oil painting, 1908, (Municipal Arch), NGV Australia. This arch was erected by the Corporation of Melbourne. The arch in the image above is the Municipal Arch in Melbourne. 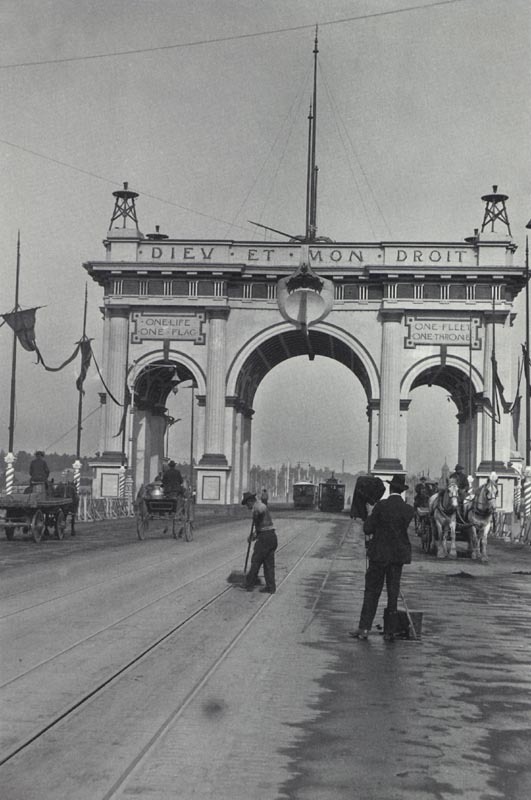 For the May 1901 celebrations, Prince’s Bridge, which was then the main entrance to Melbourne, was transformed into an imposing gateway with the construction of this temporary arch. The early Renaissance or Roman-Doric design bore similarities to other famous arches: the Arc de Triomphe du Carrousel (1808) in Paris and the Marble Arch (1828) in London. They in turn were inspired by Roman structures like the Arch of Septimius Severus (203 AD) in Libya, and the Arch of Constantine (316 AD) in Rome. The Municipal Arch was inscribed with mottoes from the British Coat of Arms and lines from poetry by Virgil and Tennyson. 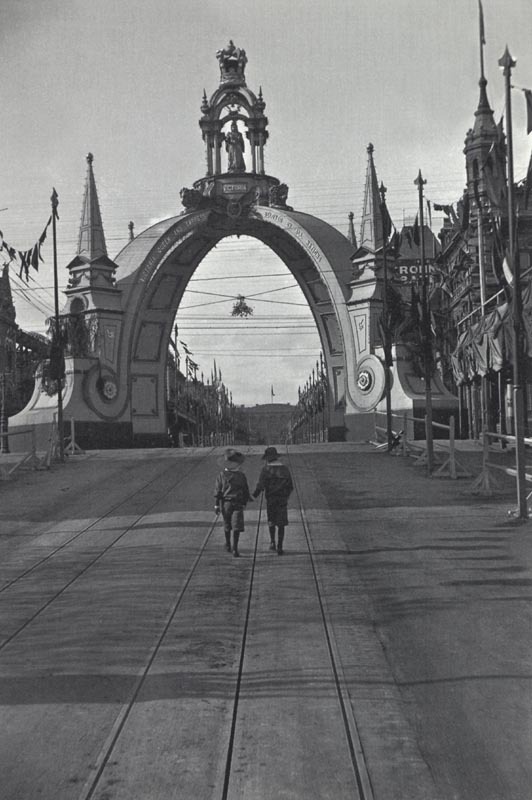 Anne Whalley of the Museum of Victoria has written about Melbourne’s Federation arches. 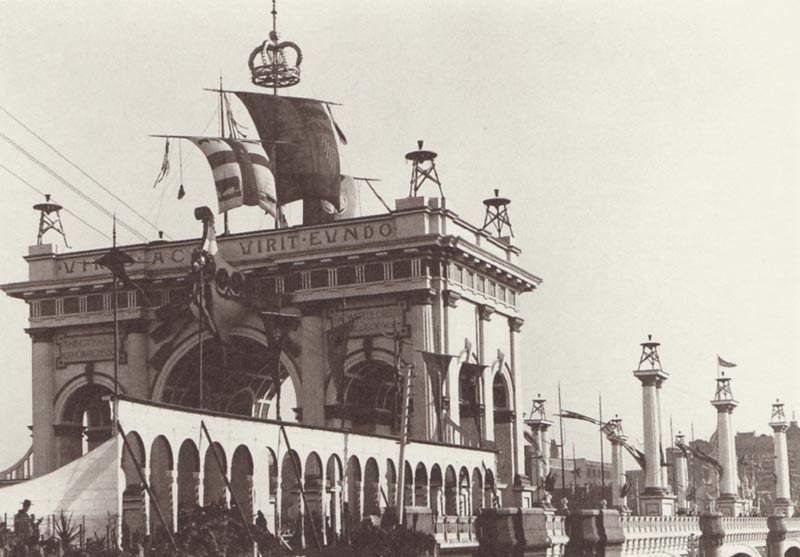 She notes that the Victorian arches had a stronger royal theme than those in Sydney, with the Victorian Government erecting arches to honour the King, the Duke and the recently deceased Queen Victoria. These were adorned in royal symbols, images, colours and patriotic mottoes. Two almost identical sepia stereographic views mounted on thick brown card. 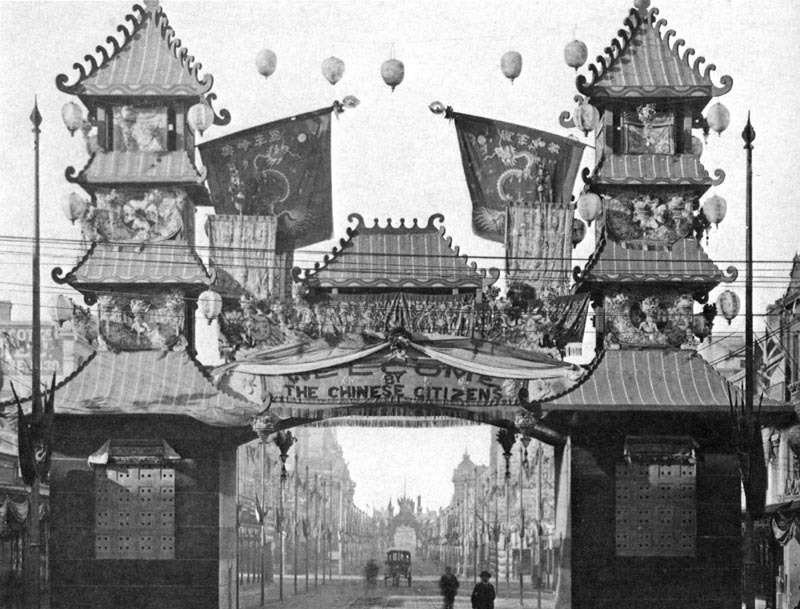 The images depict the Queen Victoria's Arch on Collins Street and a Chinese procession passing underneath. Photographer: George Rose, Melbourne. Museum Victoria. 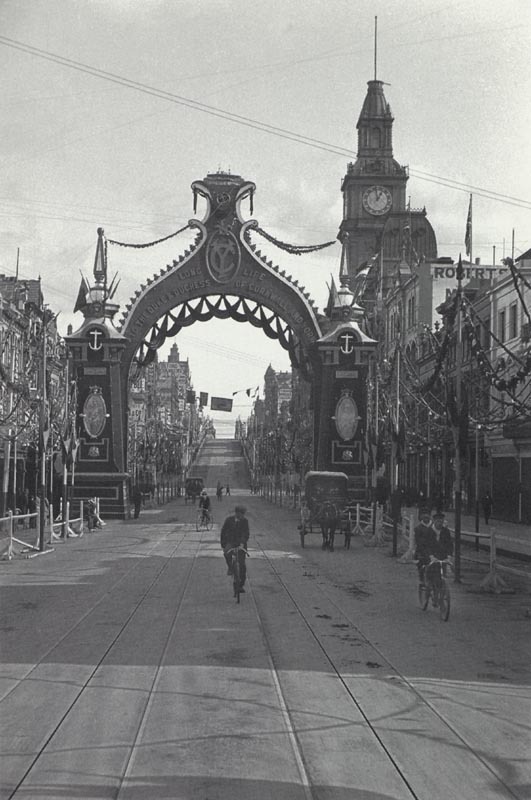 The Butter Arch erected on Collins Street in honour of the visit of the Duke and Duchess of Cornwall and York for the opening of the first Federal Parliament on 9 May 1901. The arch resembles battlements and flags fly from each turret. In the centre are the six shields representing each State. MELBOURNE'S Federation Arch is rusting away in a council depot seven years after it was the centrepiece of centenary celebrations. The artwork lies in pieces among rubbish, after Hume City Council won a bid to provide a home for the controversial arch in 2003. A lack of funds and corporate sponsorship has left the arch, which once read "One people, One flag, One destiny", to waste away in Sunbury council depot. Hume city councillor Jack Ogilvie said the council wanted to ignore it. "They want a great big tarp to just go over it, to grow grass and just have it disappear," he said. 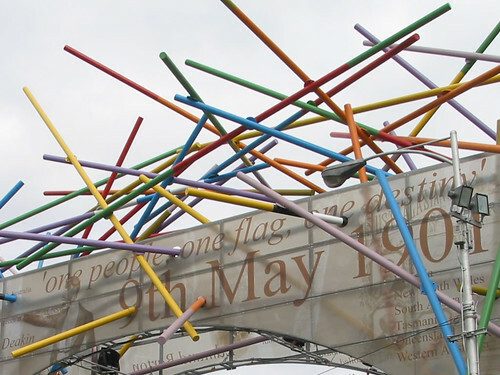 Nicknamed "pick-up-sticks", the arch was the gateway to St Kilda Rd for Melbourne's Centenary of Federation celebrations in 2001. Extracts from an old Herald Sun article, Feb 2008. 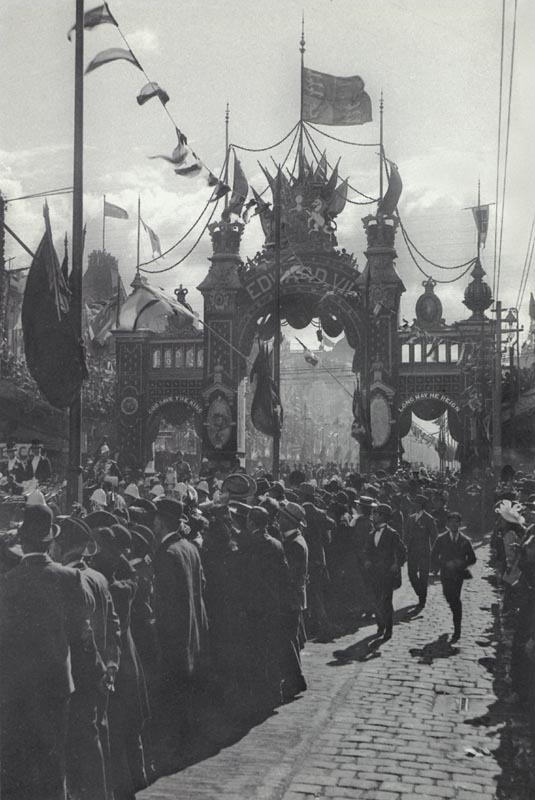 The Citizens' Arch, Bourke Street Melbourne, for the Federation celebrations, May 1901. The Arch has the inscription 'Citizens Welcome the Duke & Duchess of Cornwall & York' and bears effigies of the royal couple. Photograph taken looking west along Bourke Street from Russell Street. On the right is the Melbourne Coffee Palace and, beyond, the Duke's Arch and General Post Office. The Municipal Arch, Princes Bridge. And the 2001 Federation Arch should have been re-erected maybe near Melbourne Airport as the gateway into Melbourne. It would have looked spectacular there with some great lighting at night. 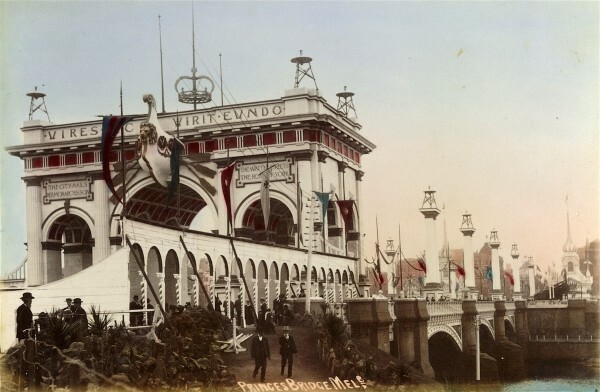 The Princes Bridge Railway Station and Flinders Street Railway Station towers built for the Federation celebrations, May 1901. Viewed looking west along Flinders Street from Swanston Street. 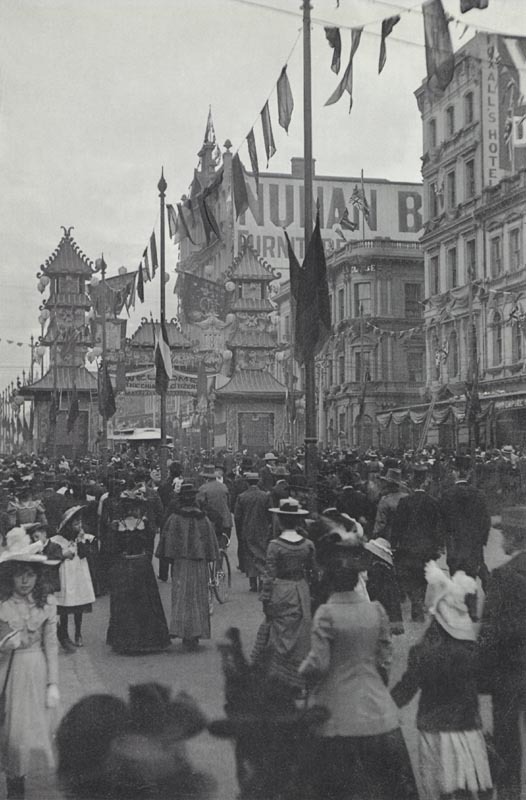 An hoarding on the left of the towers carries advertisements for 'Hans Irvine's Great Western Wines and Pure Grape Brandy', 'Two-Seas Tobacco' and 'Brinmead Pianos at Allan & Co, Collins Street'. A cable tram track runs the length of Flinders Street. In the distance, is the Flinders Street Railway Station clock tower [now housed at Scienceworks, Spotswood]. 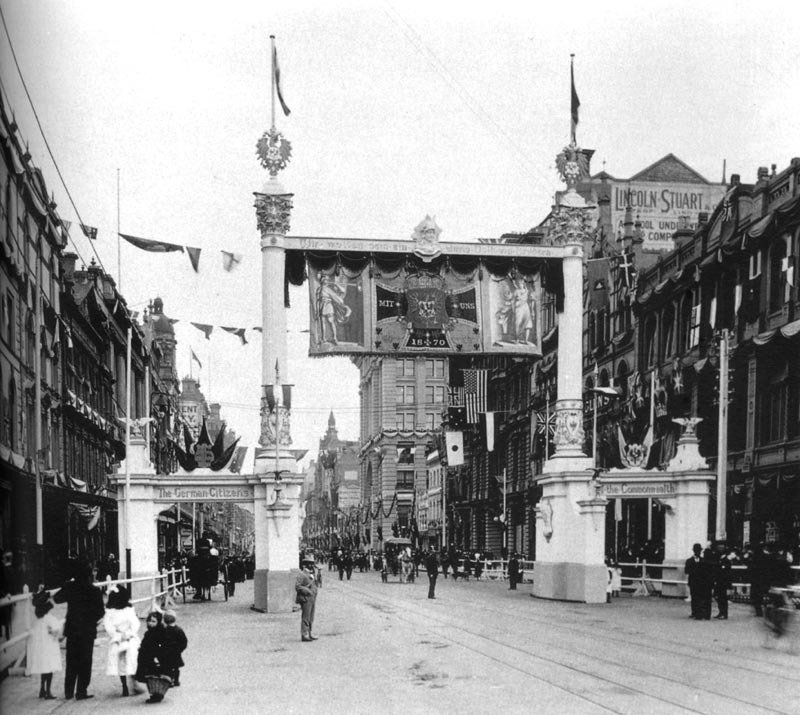 Another great shot of the The Queen Victoria Arch, this time looking south from Russell Street. The Illuminated Arch and Fountain in front of Flinders Street Station. Municipal Arch at night with other lit up structures along Swanston and Flinders Streets.